Labor Day is the perfect holiday to enjoy a festive drink, while saying cheers and goodbye to a fabulous summer. Celebrate the weekend with a Red, White, and Blue Shooter! It is sweet and yummy! The layered look is so fun, but can be tricky to achieve. After doing some research, we found that the best way was to use a medicine syringe. It seems like a strange way to make a drink, but we had some extras from our kids, and gave one a try. It worked great and our shots looked awesome! 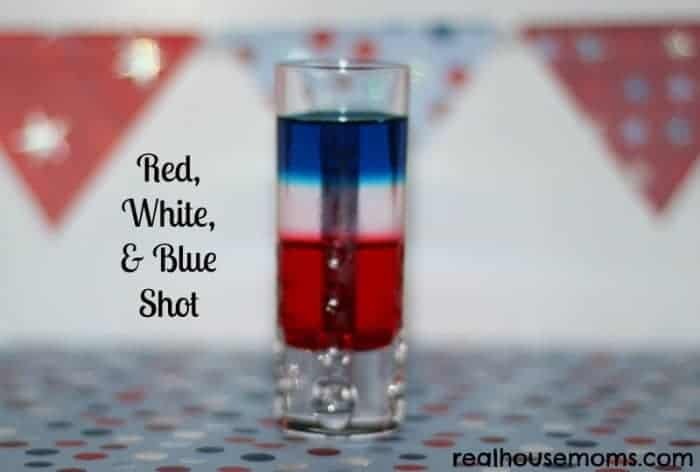 This Red, White, and Blue shooter is the perfect, fun drink to help celebrate. It's so pretty too!!! Say cheers, clink your shot glasses, and enjoy! This was made by trial and error. Layering the different colors can be tricky. We tried floating the colors with the back of a spoon, but after some research, we discovered that using a syringe was the most effective way to layer the colors. I realize it sounds strange to do it this way, but it looked perfect.